Ultimate: The Greatest Gift Ever Given. About the Author. Pasquale Anthony Leonardo IV also known as "Tony" began his ultimate career in 1988 in South Bend, Indiana at St. Joseph's High School where he co-founded the ultimate team C.H.U.D (Catholic Highschool Ultimate Dwellers) even though we never actually played a game or practiced. In 1991 he founded the University of Notre Dame team (now called Papal Rage). In 1993 he finally stopped playing in blue jeans (outdoors) and pajama bottoms (indoors). In 1997 he played with New York's club team Blood and just missed Nationals. From 1997-1999 he covered the UPA College Championships for the UPA Newsletter. In 1998 World Ultimate Magazine made him rich and famous, mostly rich. From 1996 to 1999 he wrote extensively both online and for the Newsletter for the UPA Club Championships and the UPA College Championships (then called Nationals, now called the USA Ultimate Championships) in both college divisions and all four club divisions, variously: women's, men's, masters and mixed. In 1998 he was the first to cover the inaugural UPA High School National invitational in Maplewood, NJ. In 2010 he covered and played in the Masters division at the USAU Championships and covered and played in the 2010 WFDF Club Worlds that summer. In 2011 he was selected to play for Team USA (Masters Division) for the World Beach Ultimate Championships in Lignano Sabbiadoro, Italy, and won his first Gold medal. From 2001 to 2005 Tony (an inglorious and shabby nickname that, nonetheless, he is most commonly known by) captained a team at the Paganello World Beach Ultimate tournament in Rimini, Italy. At Paganello Tony was also in charge of the daily newsletter, content for the magazine, website and English game coverage for the Paganello DVDs. He rolled Paga again in 2009 with the Boracay Beach Dragons. 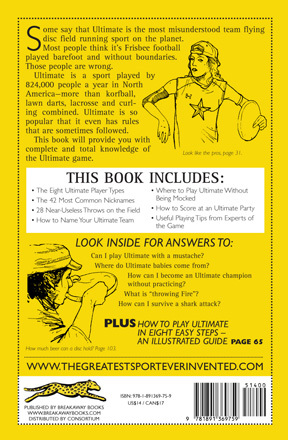 From 2004 to 2006, Tony co-wrote and co-edited the history of ultimate frisbee, the colorful and complete 196-page coffee table book Ultimate: The First Four Decades (which is out of print, but you can pony up $150 for a used copy on Amazon currently). 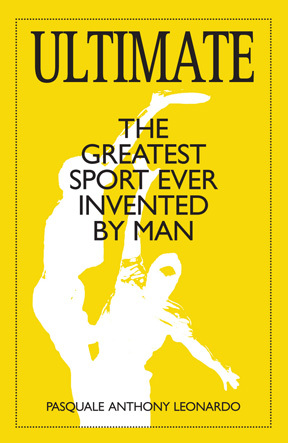 With the wealth of information gathered for the book Tony unwittingly collected the seeds and strains for the very fitting Ultimate: The Greatest Sport Ever Invented By Man, which you see here, published in 2008 with a second edition-published in 2010. Tony has also written print and online coverage for the 2000, 2002, 2004 and 2010 World Ultimate Championships, wrote and produced the DVD for Sandblast 2005, did the play-by-play and color commentary for Worlds 2010, Beach Worlds 2011, much of MLU's inaugural season on the East Coast and the 2013 World Games in Cali, Colombia. He was the Media Director for the 2006 Junior World Ultimate Championships outside Boston and WFDF's Media Man for 2013 World Games among various other roles in and out of ultimate. He would also like to make special mention of winning the 2008 Malaysia Ultimate Open with the Bangkok Soidwagz because that's when all the world was small and he was large. He lives in Brooklyn, New York and works in the television and film business. His short narrative film about a female bike messenger, Kaya, has won two film festivals. His next project is a feature film.